Boer Goats - Starter herd of six pure Boer Does and one good Buck. Located at Stratford, near Sale. Quiet and well handled, drenched, good with fences,vaccinated etc. 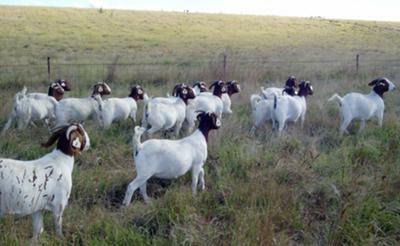 Experienced breeder will provide information and support to be successful with Boer Goats. These goats are for breeding fast growing high quality kids, and the destination property must be set up with good fencing, shelter, and good feed and water. Price is $1650 for the group including GST. Registered Bucks and Does also available.